Walking the Rep as PM Tight Rope: Can Broker Dealers Achieve Balance? Rep as PM is currently the most well-known yet heavily scrutinized program in the market. However, it manages to continue to draw in assets with no sign of slowing down. According to WealthManagement.com , “Over half of advisors- 54 percent - say they’ve been using Rep as Portfolio Manager platforms for the past five years.” In a similar vein, Cerulli Associates anticipates that RPM programs will enjoy double-digit growth over the next several years, rising to nearly $2.2 trillion by the end of 2020. How should broker dealers respond? 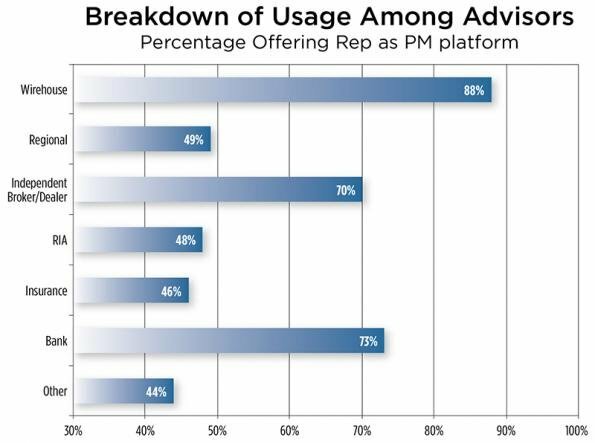 Though PM programs satisfy advisor demand for flexibility and autonomy, they may also introduce enterprise and operational risk. Without the right technology and processes in place, the home office may struggle to maintain oversight and control. And the challenge is compounded when the home office permits varying rule sets for different types of advisors. Using VestmarkONE, the home office can launch and manage any advisory program including Rep as PM. The platform offers a flexible “turn the dials” approach to enforcing myriad portfolio construction, trading, compliance, and workflow-related guidelines, rules, and tolerances. It’s the only portfolio management platform that gives advisors the flexibility to customize portfolios in a scalable way while implementing non-invasive guardrails to effectively mitigate enterprise risk.